EAS have been donated two homemade telescopes recently that we cannot keep but may be useful to others. Both are homemade (in Polegate) and are unusual designs. So if you know someone or an organisation (like a school or college) that could make use of them please let me know. All proceeds from them go to EAS. 1. 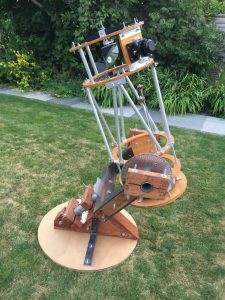 12in Newtonian Reflector on Equatorial Mount. This is a fork mounted truss tube, wood, aluminium and steel design and as it splits into 3 more manageable pieces is currently at my home. The scope splits into Tube, Fork Arms and Base for much easier removal – the base actually splits into two as well if required. It was an unfinished project – but seems pretty much complete to me. It is manual and I have tried it out on Jupiter although it probably needs better collimation. Focal length is about 1000mm. 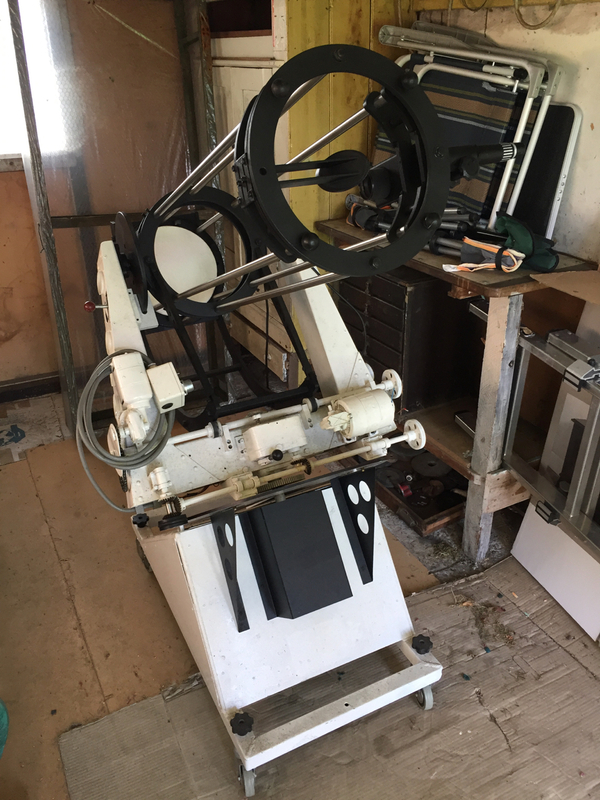 The design is actually quite good – with extension knobs for the primary mirror collimation screws so you can easily adjust whilst looking through the focuser – although I have added a couple of nuts to lock it into collimation – and it looks really nice. 2. 10in Newtonian on motorised Equatorial Mount. This scope is also a fork mounted truss tube design. It is in one piece and hence is more awkward to transport. It is on casters so it can be wheeled around. It has RA and DEC motors running off 240v – so an RCD trip plug is required for safety. This is made of plastic, aluminium and steel. This one is still at the owners home and would require a large 4×4 or small van to transport. Focal length is about 1000mm. This would be ideal for a school or college science and/or engineering project. There is even gearing built-in to follow satellites.